I used Essie Mink Muffs as a base, with (from thumb to pinky) CND Bicycle Yellow, American Apparel Manila, a mixture of L.A. Girl Army Green and American Apparel Cotton, L.A. Girl Army Green, and Zoya Jancyn for the owl colors. American Apparel Cotton was used for the white of the face, with MAC Showy for the dark brown outlines around everything and in the background. For the eyes, I used CND Bicycle Yellow. In regards to the shoulder & neck pain, it my have something to do with your pillow arrangement. Not having pillows that suit you can lead to a problem called Frozen Shoulder Syndrome. A simple test to see if you my be suffering from this problem is to lift your arms above your head and if your problem shoulder cannot reach as high as your other then you may have this problem. Physio is great and has helped with many of my problems and is a great solution. I hope this can help. Love the nails so much! So cute! I hope your neck gets better soon! I love this design,its just so cool! Haha super cute! Hope you feel better soon! those nails are my favorite so far! It's really inspired me to do more nail designs like it. Ive been a sneaky follower for a while now. Alternate between heat and ice. It'll feel better faster. So 20 mins of heat, then 20 mins of an ice pack. Repeat. Ahahaha these are so cool! These would be absolutely perfect for the week leading up to Halloween. 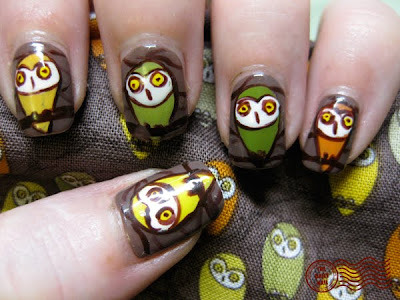 I am in love with these nails! I think this is my favourite design you've done so far! So incredibly cute! Plus, I agree with what Alexandra, biggerkrissy, and bpddjeoomon say about the neck/shoulder stuff! And acupuncture is the ONLY thing that has helped me with chronic sinus problems/allergies (after countless drugs and other crap) - so I think it's absolutely wonderful! Glad to hear it's getting better! We'll all keep sending you "happy neck and shoulder" vibes! Oh WOW you copied it REALLY well! You are so talented! You know, I like your owls better than the owls on the fabric. They seem to be the same drawing, repeated with different colors. 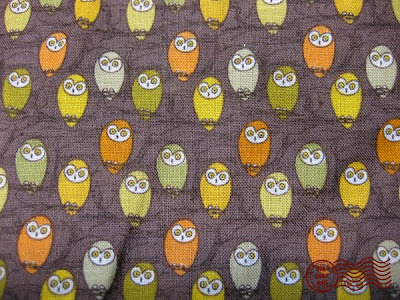 Your owls have more personality, even if one seems sad, and another looks like he's tweaking!